I don’t know much about Marian Majerovicz. His date of birth, his place of residence – and the fact that he has survived the Auschwitz concentration camp. 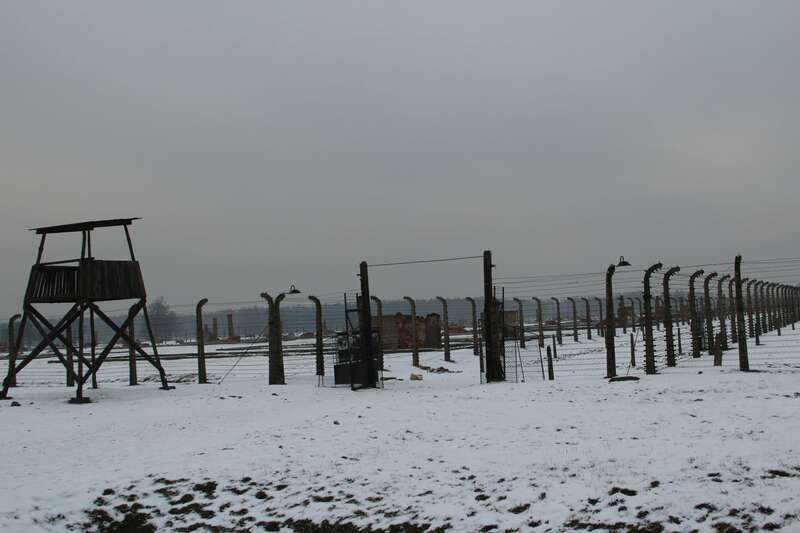 Far over one million people have lost their lives in Auschwitz during the National Socialism. How does one survive this terror? I met up with Mr. Majerovicz to talk about his time in the largest concentration camp of the Nazi regime. 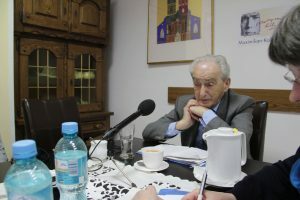 For our interview, Mr. Majerovicz is wearing a nice suit with his few hairs accurately combed to the side. He introduces himself and apologizes for the many notes he has with him. He wants to answer every question correctly and wrote down a few bullet points for every topic that might come up. He fills up his cup of tea and we start talking. childhood, he didn’t have much, but was a happy kid after all. 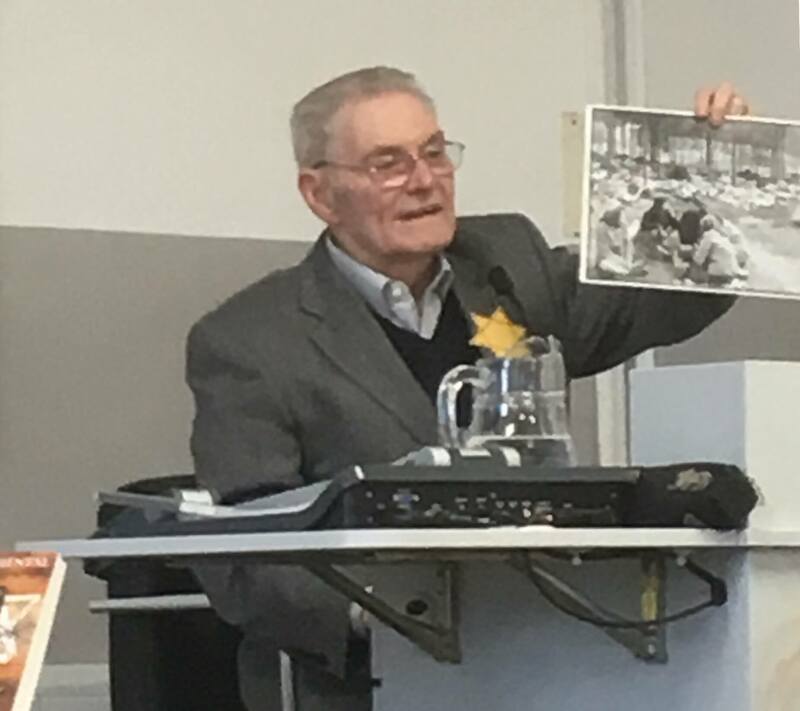 When the war came to Mischke in 1942, he was relocated to a ghetto with his family as part of the project “Judenrein” (Jew free). The inmates are living together in a small space and don’t get a lot to eat. After one year, the ghetto is dissolved. With 17 years of age, Mr. Majerovicz is separated from his family. While his parents and siblings are transported straight to Auschwitz, he and 120 other jews are relocated to a new ghetto. The lifestyle doesn’t change much compared to the first ghetto. But the stay there doesn’t last long. The ghetto is liquidated the same year. Mr. Majerovicz is brought to Auschwitz, too. All his belongings are taken away at his arrival. The camp officers shave his hair, disinfect him under painful conditions and put him into his convict’s clothes after a cold shower. Then he gets registered. From now on, Marian Majerovicz is only a number. The number 157 751. He meets his father the same day. He has not seen him for three months. Mr. Majerovicz barely recognizes him. His father has terrible things to report. Mother and brother were selected at the arrival and brought to the gas chamber the same day. The boy is in deep shock. 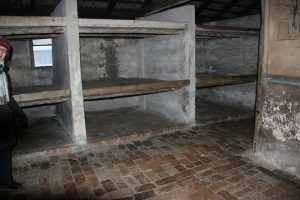 Mr. Majerovicz describes the living conditions as cruel. He only gets the chance to change his underwear every few months. Due to the lack of hygiene, it is no surprise that epidemics break out. Every inmate is ordered to live in a sector. In the sector of Mr. Majerovicz, there are no working tasks to do. Every day starts with getting up at 6 o’clock. 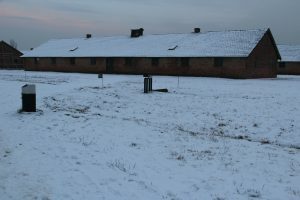 All prisoners come out of the barracks and stand in rows for two hours, while the SS men check the number of prisoners. Every inmate gets half a liter of coffee for breakfast and a soup for lunch. Mr. Majerovicz recalls the soup as “impossible to eat”. It is made out of vegetable waste. In the evening, each convict receives 300 – 350 grams of black bread with 20 grams of sausage or 30 grams of margarine. The prisoners weigh from 23 to 35 kilos. The sleeping conditions are just as bad. Mr. Majerovicz has to shares a tiny spot and a dirty blanket with eight other people. In January 1944, the 157 751 is written on a list, too. In this case, however, it is Majerovicz’s “luck”. Together with about 100 other Jews, he is selected for a provisional subcamp. To the great astonishment of the prisoners at the arrival, these are only three wooden barracks fenced with barbed wire. Mr. Majerovicz has to start working. He describes the conditions as easier. 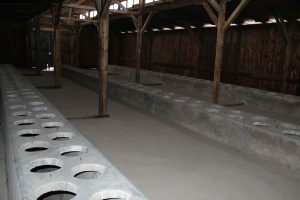 It is a working camp and unlike in the extermination camp Auschwitz, no selections are made. To work in camp construction or a coal mine, stronger workers are needed. So the circumstances are comparatively bearable. They get more food and sleep. On January 18 in 1945, life takes another big turn for Mr. Majerovicz. The Red Army has already gotten close to Krakow. Mr. Majerovicz still remembers the cold winter. One time, the now 18-year-old is awakened in the middle of the night. Everyone has to get up. Panic is spreading. No one knows what’s going on. All the prisoners are taken to a train. The train starts. 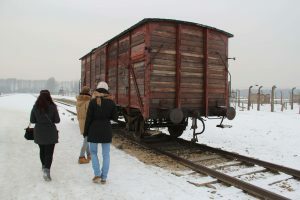 It takes Mr. Majerovicz to a well-known place: back to Auschwitz. There he is sent on a so-called death march with a group of 1,200 inmates. SS men are rushing them. For days they have to march through the cold. Sleeping is done outdoors or in abandoned camps. Only after a few days, Mr. Majerovicz gets something to eat. Many of the several hundred people that started the march die from hunger and weakness. Those who walk too slowly are shot by the SS men. The bodies are thrown into the ditches. In mid-March, the horrible journey is still not over. Luckily, Mr. Majerovicz meets a new friend and mentor. Mr. Majerovicz admires the educated doctor and professor, who always listens to him and his problems and stands by his side. To protect his older and physically weak friend from being shot, Mr. Majerovicz often tugs him by the arm. A tragic event separates the two shortly before the end of the march. 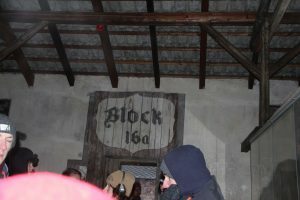 The group of only 500 survivors is to spend the night in an abandoned factory pit with no ventilation. After a while, the prisoners notice a shortness of breath. The doctor screams to the crowd: “Save yourselves, the air is getting thinner, we’re going to suffocate here!” Everyone runs to the exit. The SS men start shooting around wildly. Seven people die. Only at sunrise, they are finally left outside. Mr. Majerovicz looks around for his friend. He is sitting on a stone inside and does not move anymore. He has lost all his strength. 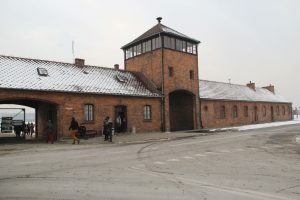 On May 9, almost four months later, the group reaches the city of Glatz. Mr. Majerovicz and the others sense that something is wrong. Mr. Majerovicz overhears a conversation between an SS man and a foreign officer. He says: “Ivan is coming.” Some see their chance and start running away from the group. Mr. Majerovicz is one of them. The SS men shoot after them, leaving many behind on the ground. With seven other people, Mr. Majerovicz hides for several hours in a barn. When they are discovered by Soviet soldiers who describe them as “more dead than alive”, they still don’t know what is going to happen. They are scared. The soldiers have already met many fleeing Jews and know about the situation. They feed the weak men in a field hospital. In a nearby river, Mr. Majerovicz can finally wash again. Many of the houses in Glatz are abandoned, so they can use the clothes of the people who have fled. For a week, Mr. Majerovicz recovers under the Soviet supervision and then he wants to return to his homeland. After many years, Mr. Majerovicz returns to his home village with a transport of the Soviet army. His mother, father and two brothers are dead. He has no one and does not know what to do, he feels “like a newborn”. But he survived. 70 years later, Mr. Majerovicz shares his story with me. He seems composed and takes long breaks while speaking. He is a man of facts. He looks at his notes a lot, tries to stay neutral and avoids any emotion. But my last question cannot be answered with facts: “How is it for you to talk about that now?” Mr. Majerovicz thinks for a long time and gets tears in his eyes. He says it is important for him to talk about it. The memory is everything that remains of his family.